Its great to see the Camel community goes from strength to strength over the years. And this year there is three new books being published. 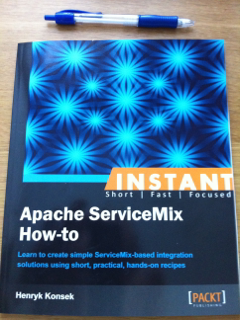 One of the books is titled - Instant Apache Camel Messaging System, by Evgeniy Sharapov. Published by Packt publishing in September 2013. This week I had the pleasure of reading the book. Its a short book with 78 pages (111 on my iPad mini) and I was able to read it in two evenings. I enjoyed reading the book as it was well written, the english language and grammar is spot on, and there is a "red line" that takes you through the content, with nice transitions from one section to the next. The book explains what Apache Camel is in 4 pages. It is a good attempt, but I would liked to see more details, and a figure to better explains the relationship with Camel, Components, Routes, and EIPs. Installing Apache Camel is focused primary on using Apache Maven as the built tool, and this book, covers how to create a new generic Maven project from the command line, and then how to add Camel dependencies, and prepare the project for Eclipse or IDEA editors. Though the author also covers how to manually download and unzip the Apache Camel distribution and how to add JARs to your project. Along the way in the book there is small screenshots of the example project structure and code listings of the Maven pom.xml file and other important pieces to highlight. The author has done a great job striking a balance to the reader so he can easily follow what is going on. I really like its the same example that is used throughout the book, and is being modified on the way, as Camel's functionality is unlocked. I would have liked to see how to create new projects without the command-line such as from the wizards built-in Eclipse. That is easier today as Maven is provided out of the box in Eclipse. Also mentioning about the Camel Maven archetypes would have been good. 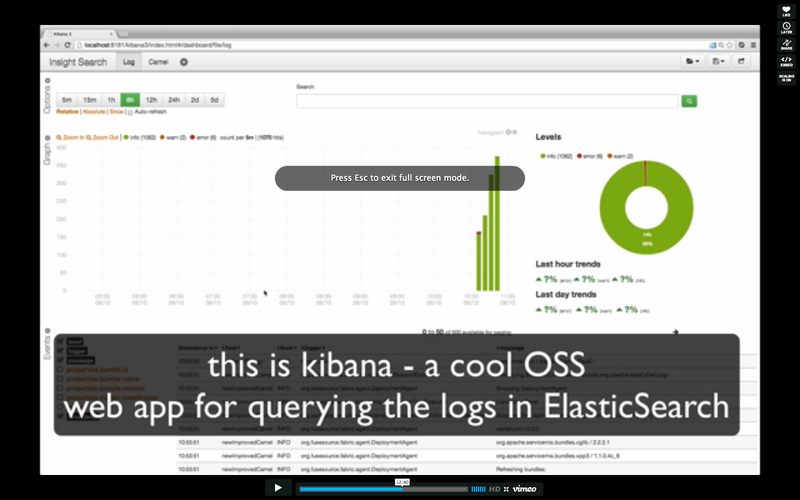 In the quickstart chapter we develop a small Camel application that logs a message to the logger, using a Camel route. The content is good and I like there is a screenshot figure of running the application, which shows the reader what happens. The book also goes a bit deeper explaining what CamelContext, and RouteBuilder is. And how the quickstart application works. This chapter is covering 6 must-know features - though unfortunately the author does not summarize which 6 features that would be. This is the big and main chapter of the book, that uses the same example which we then add functionality on the way - this is very good. Later in the chapter a new real-life example is being covered about custom document declarations. This is a very good example, and the reader learns how to use content based routing, xpath and java predicates, xslt transformation, using JAXB, and how to write Camel type converters, and a little bit about JMS, and how to put that together and unit test as well. The reader is also shown how to build unit tests, and touching how to advice the routes during testing to mock/replace parts making unit testing in isolation easier. There is a few minor information that could have been updated. When you write a custom Camel type converter, you should use the fully qualified classname of the type converter classes in the META-INF/.../TypeConverter file. This is what we recommend. Also writing a custom type converter for XML -> your JAXB object is not needed as just use camel-jaxb and include the jaxb.index file and Camel has a fallback type converter built-in that does this out of the box. All together a great example that shows more of Camel powers at the time, when the reader is ready to learn more. Very well done by the author. The book ends with some details where to find more information, such as other books, and online material on other web sites, user forums such as stackoverflow, and Camel bloggers. A nice touch but I would have liked to see a bit more detail, as the Camel community is vast, and there is a lot of information out there. This is a great book for new users to Apache Camel, who are looking for practical examples how to get started using Apache Camel, who may not be able to find such information in one place. All the information you need to get started with Camel is there at your fingertips, but you have to be prepared for being practical and try the source code of the book. This book is not for experience Camel users, whom already have built a couple of Camel applications. After reading this book you will be much better prepared to be successful and be able to learn more and use Apache Camel in your day time job. The information in the book can be found freely available on the internet today, but you will need to jump between content and that would take you a much longer time, than it would be to just purchase this eBook and in a few days be prepared for working with Apache Camel. The title of the book is misleading, I blame the publisher, for not taking the title serious. There is another book that hit the market with a similar scope and title. Readers are being mislead. This book doesn't cover messaging. Its a beginner/introductory book. Use that in the title! It seems the publisher takes some integration like words and put together at random. What if the title was: Instant Concise Application Messaging Exchange Language (hint) - that would be confusing as well. Though possible could be more creative with the title, and maybe something like: Instant learn using Apache Camel in 2 days. Okay besides the title, the book is only for new users, but its a great book. Rating: **** (4 out of 5) based on being a highlight practical book for new Camel users, that is easy and fun to read. After reading the book you have a feeling to learn more, and wished the book had more pages. Along the way you may want to read these freely available information as well. They explain what Apache Camel is in more detail, and also goes more in deep with the Camel concepts with is important to know. Disclaimer: I am co-author of the Camel in Action book. And I end this blog by congratulating Evgeniy Sharapov for authoring a great Apache Camel beginner book, that is a joy to read. You sure have flair and talent for writing. Hope this is not the last book from your hands. 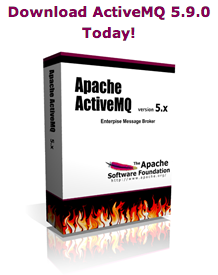 The Apache ActiveMQ team has just released the new ActiveMQ 5.9 release. This release is 8 months of hard work since the previous 5.8 release. In this release we have as usual more hardening of the broker, and the recent new protocols such as AMQP and MQTT. Also very interesting is the hardening of the leveldb persistent store, which now also includes a new replication functionality. 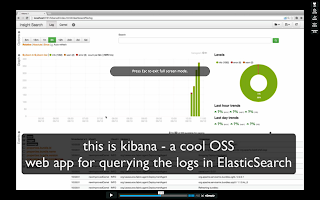 Over time level db is planned to be default out of the box persistent store, instead of the current kahadb store. Though we are not there yet, so kahadb is still the default store. Another great new functionality is the ability to do runtime configuration changes to the broker without having to restart the broker. You cannot change everything yet, but you can for example update network connectors when you have clustered brokers etc. The documentation details which parts can be updated. For the Camel users then there is a new broker component which allows lighter inter broker routing. Rob Davies have previously blogged about that, and provides an interesting use-case which allows to use Camel routing logic to decide if sending a message to a queue should go into the queue, or to another queue, depending on the current queue depth. 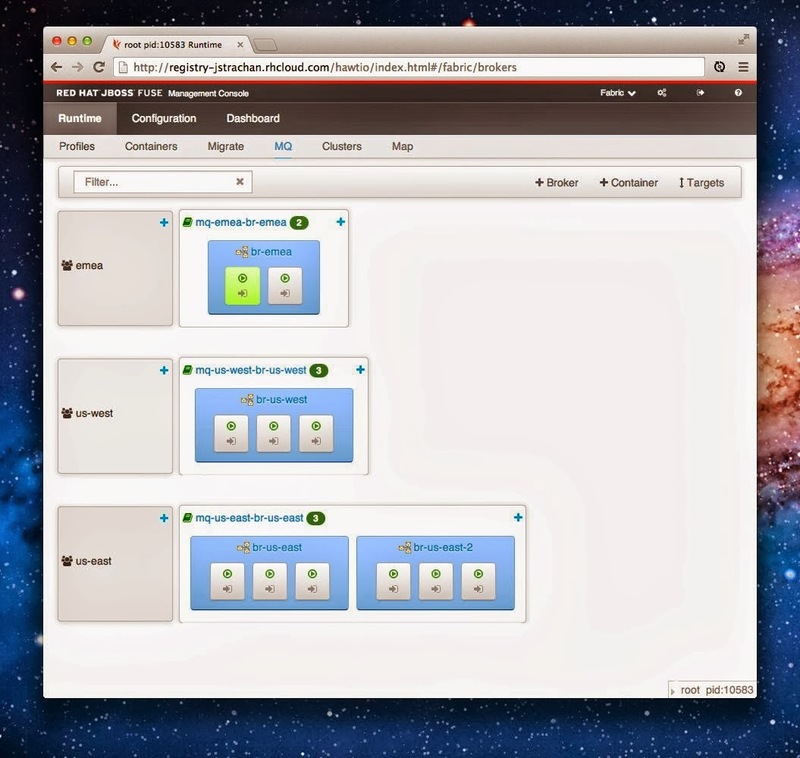 Last but not least Apache ActiveMQ now ships with hawtio as its new web console out of the box. The old web console is still there, but is considered deprecated. We also cleaned up in the conf directory, moving all the example configurations into examples/conf. Apache ActiveMQ 5.9 release notes is here. When the broker is staring up it now logs all the transport connectors it provides and their urls. There is a user guide here how to use telnet with stomp. So just open a broker on that link. When you access the console its secured, so you need to login. The broker comes with a default user and password, which you can see in the conf/users.properties file. There is also a docs/WebConsole-README.txt file that provides more details about the web-consoles, and how you can turn on|off login etc. 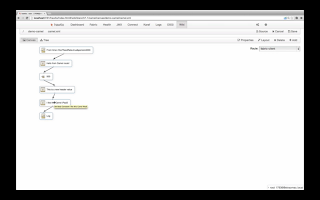 For example with hawtio web console we can create queues, and send messages to the queues. In the screenshot below I have created two queues: beer and wine, and send a message to the beer. 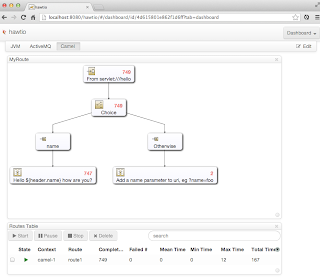 hawtio web console - comes out of the box in the new Apache ActiveMQ 5.9 release. The console has actions to move messages between queues, browse, and delete. And messages in dead letter queues, can be resubmitted to their original queue, which allows to retry processing the message(s). To try the examples then open the web browser at http://localhost:8161/ and click on the last link. PS you should also try clicking on the web console link (hawtio) as the web console now also shows the Camel plugin, as one of the examples is using Camel. 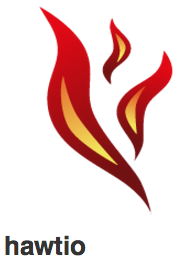 Yesterday James Strachan blogged about some of the stuff the fuse team has hacked on this year, which is included in the upcoming JBoss Fuse 6.1 release, due out at the end of this year. James doesn't blog as often, so when he does, its really worthwhile the read. 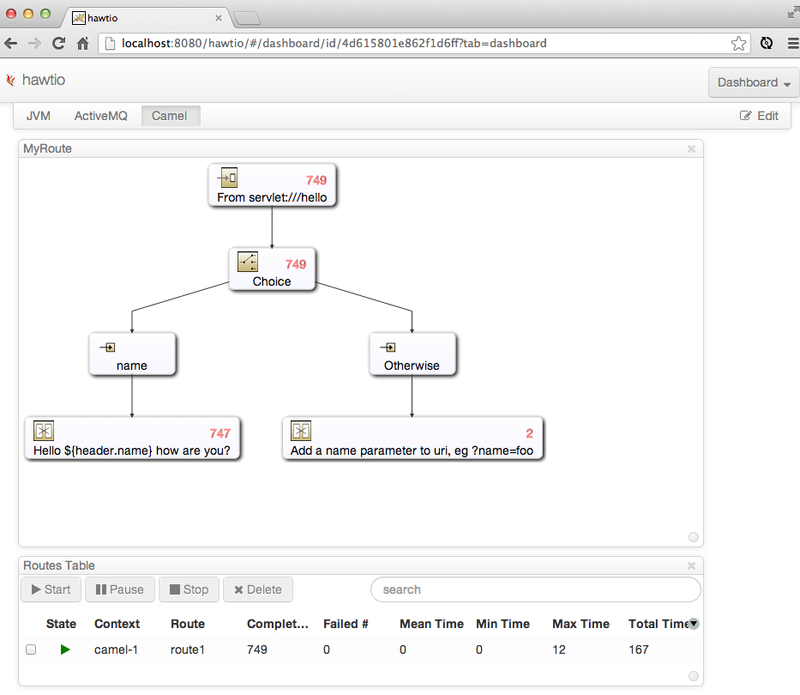 Just an eye candy screenshot here about one of the new functionalities that James talk about - ActiveMQ topologies. This functionality is the latest to the game, and was created after the Fuse team had a face to face in Dublin 2 weeks back. So if you want to see more eye candy and read what's coming then read what James blogged. Mind that this is just some of the stuff included, there is even more to come - for example a Camel data mapping tool, and log analytics is yet to be polished a bit more. 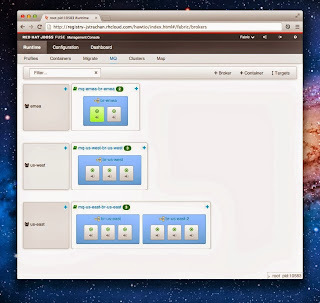 Later this month a beta release of JBoss Fuse 6.1 is expected to hit the streets, then you can try this out yourself. If not we have daily EA builds that (sometimes is broken), you can try as well. 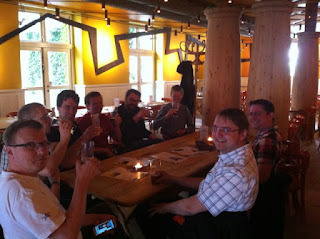 And you can catch the fuse team on IRC, if you want instant help or wanna chat via #fusefabric on irc.freenode.net. This morning while having my morning coffee I watched this video presentation on my iPad. 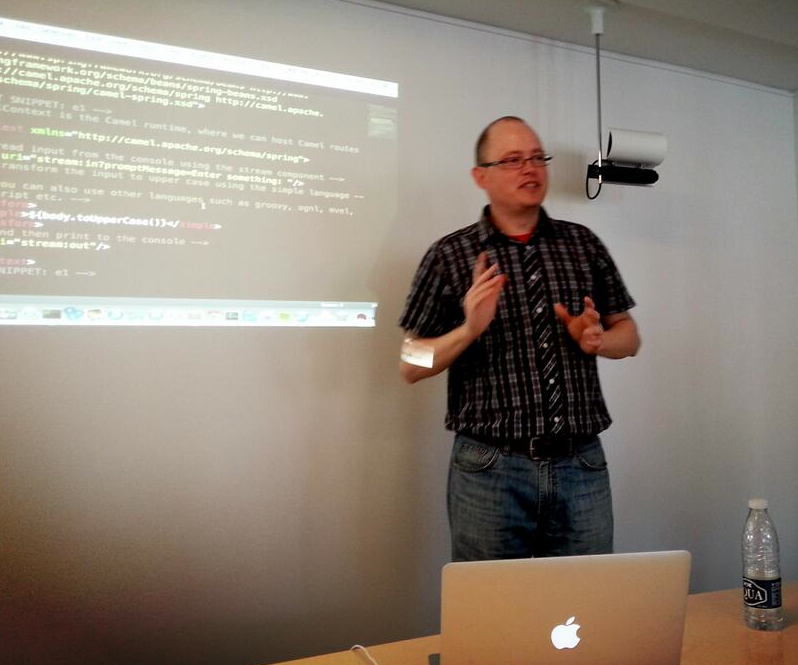 Its a 45 minute presentation by Rob Davies, whom is also working in the JBoss Fuse team. In Rob's talk he gives a run down of ActiveMQ and JBoss A-MQ, and how its multi protocol support enables the internet of things, and connecting anything together. 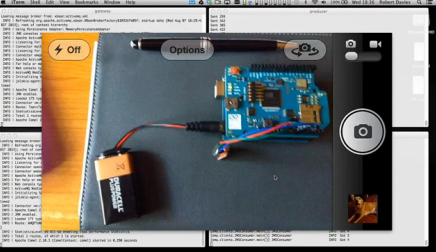 In the last 10-15 minutes of the talk, Rob dives a live demo (see screenshot), where he is using a micro controller to capture the sound and send the data over wifi to his laptop using MQTT and then bridging over AMPQ, and then eventually to a HTML5 client using web-socket. A really good presentation and demo. It was a great start of my day watching this presentation. 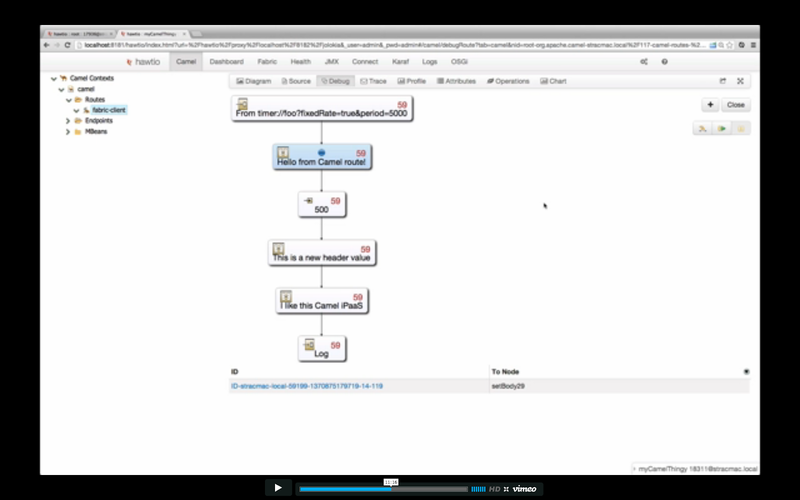 If you notice from the demo then Rob uses the Apache ActiveMQ 5.8.0 release out of the box. The video is available from dzone and you can watch it without registration or any kind of hazzle. This is another blog post about some upcoming improvements and new features in the next Apache Camel 2.12 release. In the last blog I spoke about cron expressions directly supported in the routes. This blog post is related as we have another new feature to the polling routes (using scheduled polling consumers). The scheduled polling routes will by default poll for new messages at a fixed rate (usually every half second). Though in some use-cases new messages does not arrive evenly spread over the day, but may tend to arrive in batches. So during the times where there is no new messages arriving, the scheduled polling consumer, would not pickup new messages, but still keep looking for new messages at the same pace. So what we have introduced is a backoff that allows you to let the scheduled polling consumer check less aggressive when there is no messages. backoffMultiplier = To let the scheduled polling consumer backoff if there has been a number of subsequent idles/errors in a row. The multiplier is then the number of polls that will be skipped before the next actual attempt is happening again. When this option is in use then backoffIdleThreshold and/or backoffErrorThreshold must also be configured. backoffIdleThreshold = The number of subsequent idle polls that should happen before the backoffMultipler should kick-in. backoffErrorThreshold = The number of subsequent error polls (failed due some error) that should happen before the backoffMultipler should kick-in. The scheduled Polling Consumer is by default static by using the same poll frequency whether or not there is messages to pickup or not. From Camel 2.12 onwards you can configure the scheduled Polling Consumer to be more dynamic by using backoff. This allows the scheduler to skip N number of polls when it becomes idle, or there has been X number of errors in a row. See more details in the table above for the backoffXXX options. In this example, the FTP consumer will poll for new FTP files every 5th second. But if it has been idle for 5 attempts in a row, then it will backoff using a multiplier of 6, which means it will now poll every 5 x 6 = 30th second instead. When the consumer eventually pickup a file, then the backoff will reset, and the consumer will go back and poll every 5th second again. In JMX you can see whether the backoff has kick-in, as the consumer would have the attribute backoffCounter > 0. So CamelOne 2013 is starting on sunday evening with a reception with drinks and beers. What a great way to start. You can find details when and where at the agenda from the website. So make sure to attend on sunday evening if you can. This is the 3rd annual CamelOne conference, which is focused on the Apache integration projects such as Apache Camel, ActiveMQ, ServiceMix, Karaf and CXF. The speakers at the conference includes the founders of these projects, leaders, committers, long term end users, book authors, and as well end users who are using these projects in their companies. We have a mix of speakers who are the people who hack on the projects all day long, and as well people who have used these projects in large projects at their companies. So you get information from both sides of the fence. Rob Davies have blogged about what to look forward to at the conference. And as well giving a teaser for his talk about connecting applications everywhere with ActiveMQ. Christian Posta who has dived deep into the internal of ActiveMQ is giving a talk about ... well the internals of ActiveMQ. I will give a getting started with Apache Camel presentation, which is aimed for beginners or new users of Camel. And on the 2nd day I give a rundown of the common Camel components, and as well how to build your custom components. Both my talks is a mix with slides and practical live coding sessions. 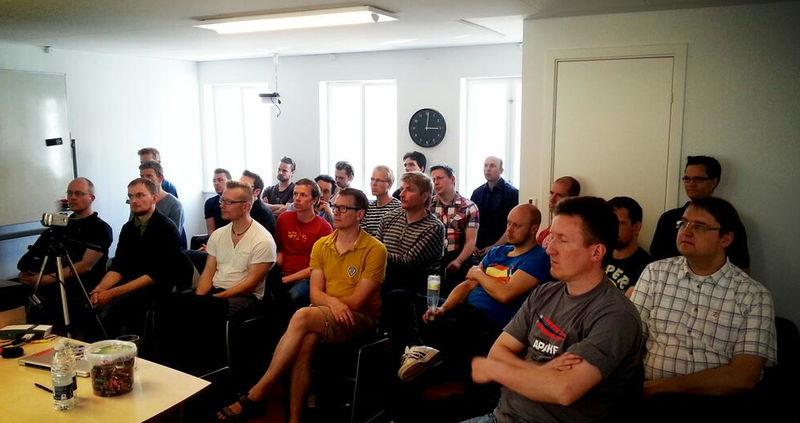 There is a couple of events coming up here in Malmo and Copenhagen which involves Apache Camel presentations. The event takes place at Foo Cafe which is not so far from the central station in Malmo. JavaGruppen Denmark is planning an Apache Camel event on April 11th in Copenhagen. The planning is still in early stages and as I understand it's an after hour event where I will give a talk on Apache Camel, and then followed on by 1 or 2 talks from people who are using Apache Camel in their organization, and share their experience - both good and the bad. I will be back when I have more details about the event in Copenhagen. 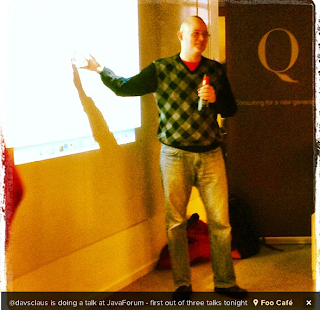 On Monday, March 19th 2007, James Strachan did the first commit what became Apache Camel. The commit log entry is here. Even in the first commit, todays users of the latest Apache Camel releases, can see the structure of the route builder, and the API with the component, endpoint, exchange, producer, consumer et all. You can take a look in this unit test from the first commit. And the content based router was already included. Though today the headerEquals predicate has been slightly changes to header("foo").isEqualTo("bar") instead. 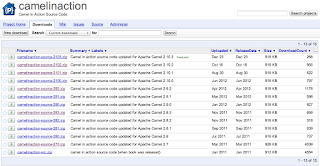 In summer 2007 Apache Camel 1.0 was released, and that was a very impressive first release, which I previously have blogged about. Today 6 years later, we have done 13677 commits on trunk (37 different committers), accordingly to the Apache Camel git commit log (git log --oneline | wc -l). 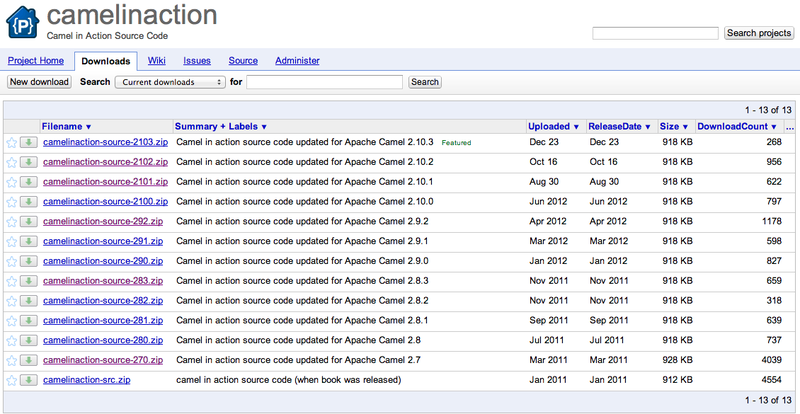 ... and yeah we are closing in on the anticipated Apache Camel 2.11 release (likely being GA in next month). 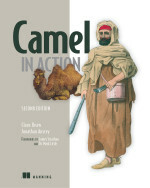 Two years ago the Camel in Action book was done and published. So when we started the journey of the book we knew we had once shot of getting this right. So Jonathan and I went all in, and worked our socks off to deliver a quality book, that do justice to the fantastic project that Apache Camel is. So with all the hard work Jonathan and I put into it, what did we get from this? Well it was not really about the money, as that can't cover cost of living. Though to treat myself good I purchased a coffee machine - which I still enjoy using ever day; the coffee tast really good. The community liked the book and have gotten good reviews. Looking today at the Amazon site, we have 10 top-mark reviews. The last review is as late as December 26th 2012, so people are still finding this book useful. The book seems to go well over the years, for example the last quarterly sales figures I have (Q2 2012), the book sold 701 units. Sidenote: As a reader of other books, this is not always the case, where the authors have this devotion to their book. As a reader I fell disappointed to get started with a book, and the source code is outdated, and don't compile/work anymore. Or that mistakes in the book is not pointed out in an errata. And when I want to interact with the authors, they are not responsive on the official book forum. When our readers find a mistake in the book, they report that to us on the book forum, or by sending private emails. We then take a look, and if there is a mistake, make sure to get the errata updated, and submit that to Manning; whom them publish the update on the book site. For example the last errata update is from July 2012. Over the years since the book was published, we have released new versions of Apache Camel. So as a courtesy to new readers we are keeping the books source code in sync with the Camel releases. We only missed the Camel 2.6.0 release which was the 1st release after the book was published. So today we have 13 updates to the source code available for our readers. 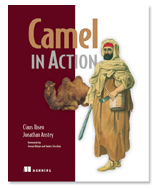 Source code for the Camel in Action book, updated with the following Apache Camel releases. The source code for the book has also been useful to the Camel team. So every time we are working on a new release, we run that release against the source code of the book, to test for any regressions etc. Over the time we have actually found a number of bugs, which we could fix before cutting the release. So today we are in the year of 2013. And as I write this we have just added a new component to the upcoming Apache Camel 2.11, that allow to run web applications with Camel without having to rely on Spring Framework to boostrap Camel. Or any other 3rd party frameworks for that matter. A bit ashamed to say that in the year 2013 we are a bit late to the party to offer this out of the box in Apache Camel. In modern web containers supporting Servlet 3.0 spec. you can programmatically bootstrap your code using the new @WebListener annotation. But even so there is still work to be done, as you would need to setup and configure Camel, and as well ensure resources is unregistered and stopped when stopping the web application. I have not found a neat way of using @WebListener and allowing external configuration of your framework such as Apache Camel. I dont really want to hardcode my configuration, or have to invent my own way of loading external configuration and configure my application. Anyone know of a solution to this problem? Anyway we also wanted a solution that works for old school Servlet 2.x based container. There is a ton of them out there running. And even so the old school configuration with a web.xml file works just as good in the newer Servlet 3.0 containers. So we wanted an out of the box solution that fit both worlds. We have a number of examples at Apache Camel, and one is a simple web application that is ready to be deployed as a .war file in Apache Tomcat, or any other web container. This example is using the Spring Framework to boostrap a Spring XML file, where we have Camel embedded. So what we did was to redo this example without the need for Spring. In Camel 2.11 we have a new component named camel-servletlistener, which offers a new CamelServletContextListener class which you configure in the web.xml file. This will then boostrap a CamelContext, and use the context init parameters as its configuration. This context listener has a lot of configuration, so you can easily configure Camel to your needs. And in case you need to execute any custom logic when Camel is starting/stopping then we have an API for that, a CamelContextLifecycle interface. There is more details and examples at the Camel docs. 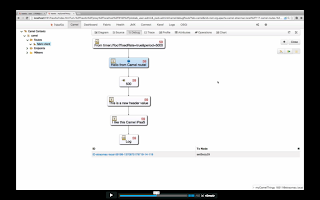 To see this in action, I suggest after reading this blog, check out the new example, as well the documentation for the camel-servletlistener component. We can take a peak at the difference between the two of them, when deploying to fresh installation of Apache Tomcat 7.0.30 using Java 1.6. I used jconsole to look at the number of loaded classes in the JVM with the Apache Tomcat and the deployed example. The heap size was measured as the lowest value I could get after performing GC. So we cut 10 JARs and 3MB from the distribution. As well avoid loading in the shy of 1000 classes. I just want to emphasize that the goal of this new camel-servletlistener component is to allow people to easily bootstrap their Camel applications in any web container, without the need to be tied to any particular 3rd party framework such as Spring. 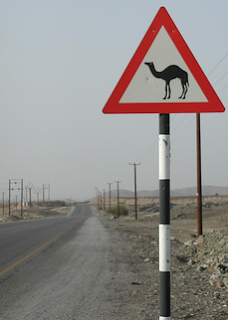 The Apache Camel project aims to be neutral and agnostic; allowing people to run Camel in any way and container of choice.